Great synergy for anyone looking to squash the runner, or make them think you are. Seriously too good in multiples, Id wager some credits this card will be appended to "Limit one per server" eventually. Weyland decks will have wet dreams of throwing all three of these into their scoring remote while holding a mix of scorches and punitive counterstrikes. NBN and Jinteki can have plenty of fun with these as well, though. Make the unfortunate encounter with Snare that much worse. This card is insane, let's get down to it. From the corp's perspective, you have to spend a click to install Prisec, then 2 when the runner accesses it. By contrast the runner spends 3 creds to trash it, then 2 creds and 1 click (usually) to remove the tag. So seen purely as econ you are looking at a 3 cred swing in your favor. Above and beyond the cred/click changeover you do a meat damage. They probably aren't running with an empty hand, but 1 card might hit something good. Prisec's tag, however, isn't really about economy. It is about click compression. The runner normally sees a run as a one-and-done kind of deal. Now the run isn't 'really' over until they have removed their tag. If they run last click they'll be ending the turn tagged. Still not so bad, but you can see where this goes. Prisec is an upgrade, and not unique. There can be 2 prisecs in a server, or three. It can live in central servers, or remotes. It can live with Snare! or an advanceable upgrade. You can come out of a run with 2 or more tags, and a mauled hand. Even just running into an Argus Security: Protection Guaranteed agenda with a Prisec is a significant hit. The brief tagged state is useful for Harishchandra Ent. : Where You're the Star , letting them see the runner's hand. SYNC: Everything, Everywhere makes the tag either more difficult to get rid of or more useful for the corp.
Further, Prisec doesn't just give you a tag. It causes you to end a run tagged. Dedicated Response Team anyone? Run into a server with a Prisec and they rez a DRT in the Jackson window and you've just sucked up 3 meat damage and a tag. And, heck, the paid response window after they hit the Prisec is as good of a time as any to rez a Zealous Judge . Yet more click compression! Now the runner has to remove the Prisec tag, then run the ZJ and trash him. Hope he wasn't behind a Data Raven. If you are playing a deck that goes for flatline and doesn't try to keep the runner out then slot 3 of these. You won't regret it. Sir, I'm going to have to ask you to get in the car. He looked at the man holding a gun to his chest. He looked at his trench-coat. He looked at his cybernetics. Something told him this man wasn't a detective. Prisec is a neutral ambush most likely to be compared to that of Snare! or News Team. It costs a mere 2 to fire, compared to the former's 4, while having half the payout, with only 1 damage rather than 3. Now you might say: "Thats not very good. 1 damage is practically a negligible amount". And you would b right about that. However, the beuty of this wonderful card lie with two aspects. It is an Upgrade, and it has three to trash costs. This is HUGE compared to Snare!, which usually was a 1 and done deal. They run, it fires, it goes to the bin. Also, Prisec STACKS so you could potentially have 3 on an essential, taxing server, kind of like an expensive Hokusai Grid. Provided the runner delines to or cannot trash Prisec, this can become a major deterrant. Prisec works wonders with Argus Security: Protection Guaranteed along with Snare!, to do huge amounts of damage with only a moderate amount of investment. One of my favorite plays is to put 2 or more Prisecs on a server, along with a Casting Called Oaktown Renovation or Underway Renovation. This basically tells the runner, "If you run here. You WILL be tagged". Provided the runner doesnt get too gutsy, you can Click up the Oaktown to 10, 20, or 30+ advancements, netting you hundreds (Maybe) of credits. 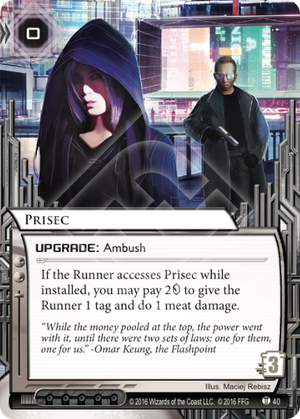 Overall, I think Prisec will find a way into almost every damage build, be it Jinteki: Personal Evolution, Industrial Genomics: Growing Solutions(Oh God no), or Argus. It even might have a home in SYNC: Everything, Everywhere! In short, this is my new favorite Ambush. Now excuse me, I have some runners to flatline. You know that one deck that uses Surat City Grid and Brain-Taping Warehouse to rez a bunch of bioroids for almost nothing? You know what the one problem with that deck is? The only good upgrades cost about 2 and are almost always unique. What that deck really needed is some sort of 0 cost non-unique upgrade that has a good ability. Prisec is a strong card and will probably see play in most tag-n-bag or super modernism decks. It gives the runner a tag which will (most likely) force them to spend a click and 2 creds to clear it. And even if they do clear the tag the corp still gets to take a card from the runner. Edit: After looking around a bit I've found that this card can also combo with Harishchandra Ent. : Where You're the Star to trash any card of the corps choosing from the runner's hand. ReEdit: No it does not.